Jesus works another deed of power, a miraculous catch of fish. Peter is overwhelmed and falls at Jesus’ feet, humiliated—a sinner in the presence of God’s power. 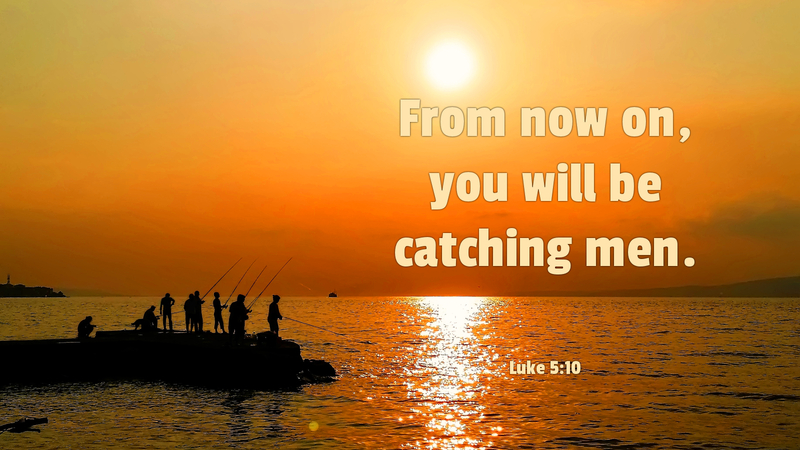 But Jesus says to this fisherman, “Do not be afraid; henceforth you will be catching men.” They left everything and followed him. It was a sure thing they would not go hungry. And from now on they would set bait to catch more men and women to follow Jesus. “Don’t be afraid. Let’s go catch some more.” We need to remember that it is the Holy Spirit who convinces people that Jesus loves them. It is through our actions and words of encouragement, caring, compassion, comfort, and hope in times of struggle that people experience God’s love and help. We are God’s instrument. The Holy Spirit is the power that moves the instrument and causes it to be effective. The fishing rod cannot catch fish. The fisherman must reel them in. It is our place to love and care. It is the Spirit who brings people to Jesus. That takes the pressure off of us. Do not be afraid. Go and love the people into the kingdom. Prayer: Holy Spirit, fill us with the love of the Father so we may love the people for whom Jesus died. Amen.